If your child has started 7th grade per NCAA rules they will not be able to attend the first day of camp (July 31st) We are prorating accordingly. 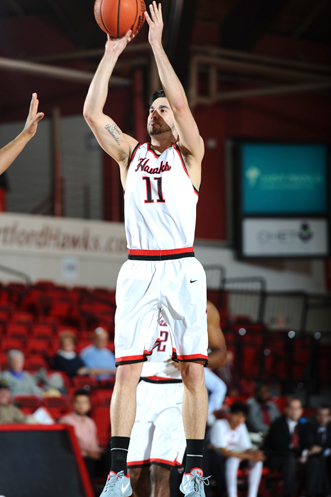 Welcome to John Gallagher Basketball Camps at the University of Hartford! As we look ahead to the warmer weather, we look to summertime hoops. That means the fourth annual On the Floor Basketball Camp with Coach Gallagher! Guess what – we need you back for more! Last summer you took camp to new heights, with your enthusiasm, your hard work, and your desire to improve. We worked on our game every day and had some fun with it. It is because of you – the campers – that it was a major success. Practice begins in the fall, games are decided during the winter, and champions are crowned in the beginning of spring. But remember, players are made in the summer! What better place to learn and practice your skill set than at basketball camp? Remember, last year was a sellout! We filled up quick, so book your spot now! We can’t wait to see you On the Floor!